So, while the weather is playing carnival, choosing another costume every day, I was busy finding a job and showing the best of me in several interviews. For one interview I went to south Germany. I love that area and the perspective to live there filled me with excitement. I stayed over the weekend to visit my family, who is basically living one of my dreams – waking up to the beautiful sights of the Alps and calling the Zugspitze their neighbor. It was a wonderful weekend and I went skiing, which I rarely do, given the fact that I live in the flat northern part of Germany. Only two weeks later I have been invited to another interview there.. yey!!! This time I was walking back to the hotel, without my jacket.. the weather changed from skiing-mood to ice-cream-mood within a couple of days and I enjoyed both to the fullest. 5. add half of the flour-cocoa mix to the batter. Mix until blended. Add other half and mix until well blended. 7. using two tablespoons, put the dough onto a baking tray covered with baking paper. Make sure that the distance between the cookies is big enough. 8. Bake 14 minutes at 180°C. The cookies can be stored in a box for up to two weeks. 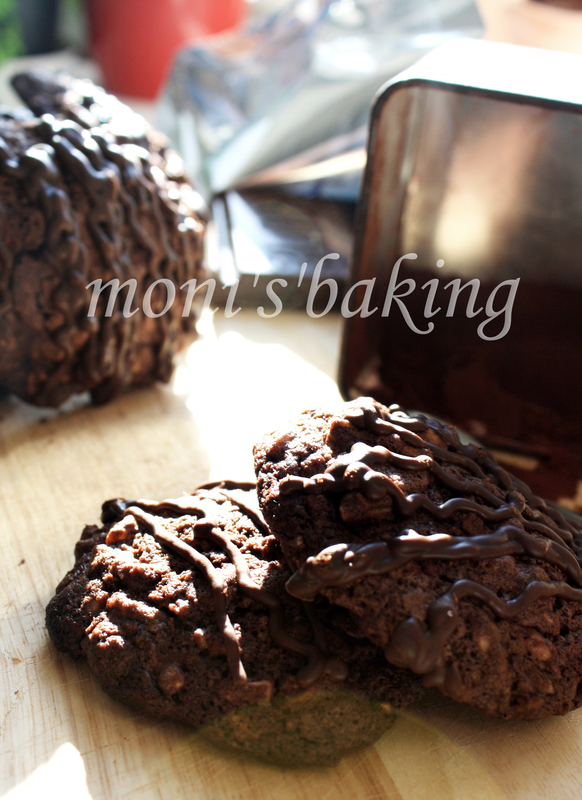 The recipe is pretty easy and the cookies are sooooo delicious. 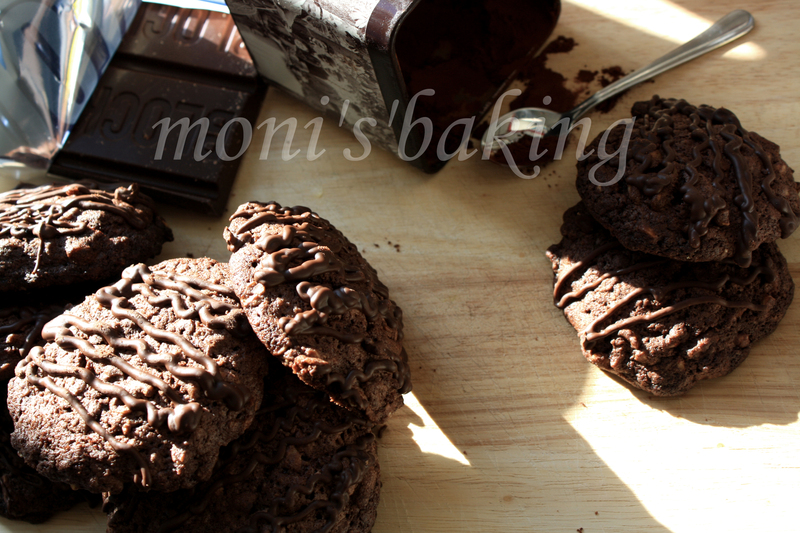 The almonds give them a taste that you wouldn’t expect and they are very chocolatey. As I mentioned before, I had some difficulties with making them for the second and third time. After the first batch was almost gone after 24 hours (I told you they are good!) I felt like I have to bake another batch, so my family would remember me after I left. Somehow the second batch came out totally different from the first one. The first time the cookies were thick and round, while they just spread all over the baking tray the second time and came out totally flat and crunchy 😦 The taste was still good, but the shape and the texture were not what we had before. I thought that maybe it is because I didn’t use baking paper the frst time, so the bottom sticked to the pan and prevented the cookies from spreading. With that thought I made another attempt to get back to the original. Two weeks later, when I visited for the second time, I made them again. The dough is enough for two baking trays, so one baking tray was with and the other without baking paper. Hmm.. what can I say? That was not the solution to the problem. In fact, both times I found myself taking out a giant cookie, covering the whole size of the tray. I cut it into smaller bites right after removing it from the oven, before the cookies cooled down and got hard. Ok.. it was worth a try. Now I was really into finding out what is going on. When I came home, I started all over again. My new idea was that it might be the chocolate that I used. We used a really dark chcocolate the first time and less dark ones the other times. The third time I even used milk chocolate, because I didn’t have any other. We know the result.. giant cookie! At home I went back to the dark chocolate with the idea that, since the chocolate does not melt so easily, the cookies might keep their shape. Aaaaand.. yep! It worked. They still came out a little more flat than the very first ones, but I am getting there 😉 We are closer to the mystery solution!